This World Food Day, ACTION is reflecting on progress made over the last five years to fill the gap in financing for nutrition by releasing Following the Funding: Nutrition for Growth — Progress Report. 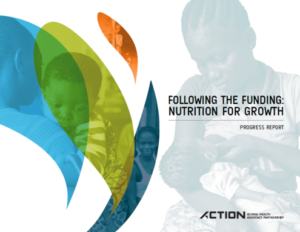 It includes ACTION’s annual nutrition financing scorecard as well as a more in-depth analysis on impact and recommendations in key donor and philanthropic markets. Malnutrition, which includes stunting, wasting, anemia, low birthweight, overweight, and obesity, plagues every country in the world, and it is the underlying cause of death for 45 percent of children worldwide. In 2012, health ministers from around the world committed to reducing malnutrition by 2025, agreeing to global targets to improve these conditions at the World Health Assembly. Based on these targets, the World Bank, Results for Development, and 1000 Days undertook analysis to understand how much funding it would take to reach these targets. Data was limited, and the financing analysis could only be completed for four of the six targets: stunting, wasting, anemia, and breastfeeding. The results were staggering: it would take USD 70 billion between 2015 and 2025 on top of existing funding levels. The ambitious commitments made in London in 2013 at the first Nutrition for Growth Summit were only the tip of the iceberg. More funding from donors would need to be mobilized, and more attention to domestic and innovative pools of funding were needed, as well. Five years on, the global community has made some progress. Innovative funding mechanisms, such as the Power of Nutrition and Global Financing Facility, have catalyzed private sector, multilateral, and domestic funding in several countries successfully. Several important donor markets have continued to increase funding for nutrition despite complex political climates in which funding for development is always on the chopping block. Still, the funding gap remains. In 2020, alongside the Tokyo Olympics, Japan will host a high-level summit as a follow-up to Nutrition for Growth in London. It will be an opportunity for countries to make commitments — both on financing and policy — to improve global nutrition outcomes. World leaders will need to show that they understand and accept nutrition as a building block of universal health coverage and a key component of success maternal and child health programs. Ending malnutrition, therefore, must be among the highest priorities. It will be critical for all commitments to be both ambitious and achievable. Now is the time for funders to consider their role in reaching global targets to reduce malnutrition and what it will take to get there. * Nandini Pillai is advocacy and impact manager at the ACTION Secretariat. The global targets are: 40 per cent reduction in stunting for children under 5; 50 per cent reduction in anemia for women of reproductive age; 30 per cent reduction in low birthweight; no increase in childhood overweight; increase in exclusive breastfeeding up till 6 months to 50 per cent; reduce and maintain childhood wasting at below 5 per cent.